To me, there are few things more American than a good ole peanut butter and jelly sandwich. PB&Js rank right up there with apple pie and baseball and have been our family favorite for as long as I can remember. When I was a little girl I remember my Mom making them for me all the time. In college, I pretty much relied on PB&Js to survive. Now as an adult I still enjoy them nearly as often as I did as a child, and serve them to my family the same way my mother did. 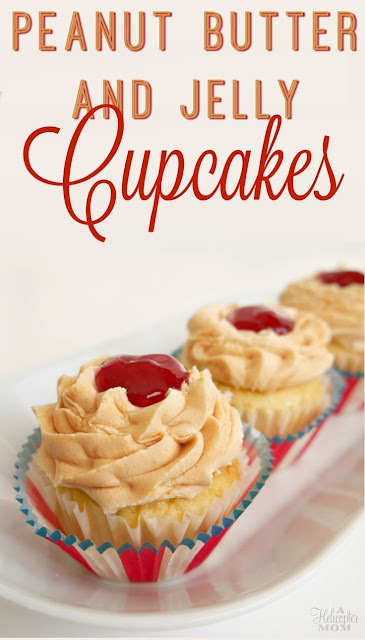 And of course, I love to make amazing PB&J treats – like these Peanut Butter & Jelly Cupcakes. Be sure to check out the recipe at the bottom! Preheat oven to 350° F. Line a muffin pan with 12 paper baking cups. In a large bowl, mix butter and sugar with an electric mixer until light and fluffy (about 5 minutes). Add the flour and baking powder slowly, blending until just combined. Bake in the preheated oven until the tops spring back when lightly pressed (about 18 to 20 minutes). Remove from oven and let cool in pan on a wire rack.